Emory's annual research funding included Winship Cancer Institute's designation as a National Cancer Institute Comprehensive Cancer Center. Pictured: Winship researcher Greg Lesinski. Researchers at Emory University received $628 million from external funding agencies in fiscal year 2016-2017. This marks the eighth consecutive year that research funding has exceeded $500 million, and with an increase from $574.6 million in FY16, is the largest amount of research funding in Emory's history. Federal agencies awarded $384 million, or more than 61 percent of the total, led by the National Institutes of Health (NIH) with $320 million in awards. 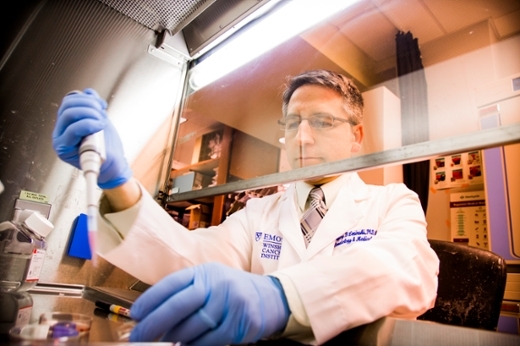 NIH funding represented more than 83 percent of total federal dollars awarded to Emory. "Research funding at Emory has continued on a strong upward trajectory over the past decade due to the hard work of our dedicated research faculty, trainees and administrative staff, and the enthusiastic support for research from Emory's leadership," says David S. Stephens, MD, vice president for research in Emory's Woodruff Health Sciences Center. "Despite continued funding challenges at the federal level, our research programs have continued to attract support because of demonstrated groundbreaking results and the promise of future discoveries with the potential to change the face of science and medicine." Researchers in Emory's Woodruff Health Sciences Center (WHSC) received more than $584.8 million in FY17, or more than 93 percent of the University total, with $353.7 million in federal funding, including $307.7 million from the NIH. The WHSC includes schools of medicine, public health, nursing, Yerkes National Primate Research Center, Winship Cancer Institute and Emory Healthcare. Emory University School of Medicine received $355.7 million, the Rollins School of Public Health received $131.7 million, Yerkes National Primate Research Center received $79 million and Emory College received $35.4 million in funding. Emory's Nell Hodgson Woodruff School of Nursing received $15 million. Winship Cancer Institute of Emory University earned the comprehensive cancer center designation from the National Cancer Institute, reflecting its laboratory research, clinical trials program, and population-based science. $12.6 million over five years from the National Institute of Allergy and Infectious Diseases to the Emory Transplant Center to investigate improved post-transplant drug regimens for organ transplant recipients. $6 million over five years from the Georgia Department of Public Health to the Metabolic Nutrition Program in Emory School of Medicine, to launch Medical Nutrition Therapy for Prevention, a medical foods program for individuals in Georgia who struggle to purchase medical foods and dietary supplements. $3.1 million from the National Institute of Mental Health for a study of 3q29 deletion syndrome, a genetic mutation associated with a 40-fold increased risk for schizophrenia and other neuropsychiatric conditions. $10 million from the National Institutes of Health for a five-year renewal of the Emory Center for AIDS Research, part of a network of 20 leading research universities. The grant will allow CFAR to continue its work in decreasing HIV incidence, improving the well-being of infected individuals, training the next generation of researchers and clinical leaders, and ultimately finding a vaccine and cure for HIV. $2.5 million from the Robert Wood Johnson Foundation to the Rollins School of Public Health to examine the relationship between physical activity and academic achievement among elementary students in Georgia. $2.5 million over two years from the National Institute of Minority Health and Health Disparities to the Emory School of Nursing, Emory College, Rollins School of Public Health, and Emory School of Medicine to investigate the effects of early environmental exposures on child health and development. $7.5 million over five years from the National Institute of Environmental Health Sciences for renewal of the HERCULES Exposome Research Center in Rollins School of Public Health. The center studies environmental exposures and associated biological responses on human health over the course of a lifetime. $13.6 million over six years to Emory School of Medicine and collaborators at Georgia Tech to create a comprehensive "omics" map analyzing metabolomics, proteomics and lipidomics data about the molecular changes that occur in response to physical activity. $2.2 million from the National Aeronautics and Space Administration (NASA) to Rollins School of Public Health to join an international team developing the world's first public health satellite mission. The NASA mission will map the toxicity of different particulate matter types in airborne pollutants over the world's major cities. $2.4 million over five years from the National Institute of Allergy and Infectious Diseases to Emory and Georgia Tech to study non-invasive imaging using PET scans to detect immune rejection of transplanted organs. $5 million from the National Institutes of Health to Emory School of Medicine in support of the Brain Research through Advancing Innovative Neurotechnologies (BRAIN) Initiative. The Emory research will focus on improving the outcome of individuals with medication-resistant mesial temporal lobe epilepsy through new discoveries about optimized use of neurostimulation therapies. $12 million from the U.S. Department of Health and Human Services to lead the National Ebola Training and Education Center (NETEC), along with partners University of Nebraska Medical Center and NYC Health + Hospitals/Bellevue. The grant doubles the current NETEC funding and will allow expansion of site visits to U.S. hospitals, more education and training courses, and building of a special pathogens research network. $1.5 million over five years from the Andrew W. Mellon Foundation to Emory University's Laney Graduate School to expand professional competencies and integrate public scholarship into humanities doctoral training, as well as graduate teaching and research. $3.7 million over three years from the Bill & Melinda Gates Foundation to Rollins School of Public Health to study the role of socioeconomic status and childhood development on cognitive and socio-emotional functioning in adulthood. $30 million over five years from the National Institutes of Health and the Bill & Melinda Gates Foundation to Rollins School of Public Health, in collaboration with Johns Hopkins University and Colorado State University, for a multi-country field trial to assess the impact of cleaner burning cooking stoves on household air pollution and health in four low- and medium-income countries. $5 million over five years from the National Institute of Neurological Diseases and Stroke to renew Emory's Morris K. Udall Center of Excellence in Parkinson's Disease Research. The center includes investigators at Yerkes National Primate Research Center, Emory School of Medicine, and Emory College. $1.2 million from the Andrew W. Mellon Foundation to Emory College to support long-form, open-access publication in the humanities in partnership with university presses.